Finish Line for the 7.1 mile loop. Freshman boys come down a tight turn heading towards the finish line. Junior Varsity boys staging for their three laps. “We set the table so the league could come serve the food,” said Gaige Sippy, the director of the Iron Horse Bicycle Classic and one of the key influential supporters of the Colorado High School Cycling League State Championship. We’re coming up on a “decade of dirt” for this state championship, and the Durango riders haven’t missed a single year of riding with the CHSCL. This year, the riders came and conquered like they always have. 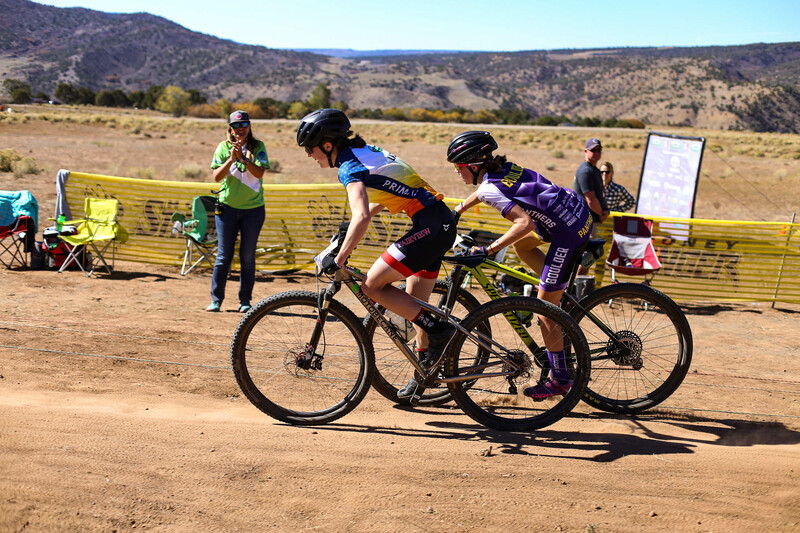 Not only did the riders show up, but Durango got to show off its iconic cycling atmosphere and dedication to the sport to the CHSCL and all of its participants on the track at Durango Mesa Park. 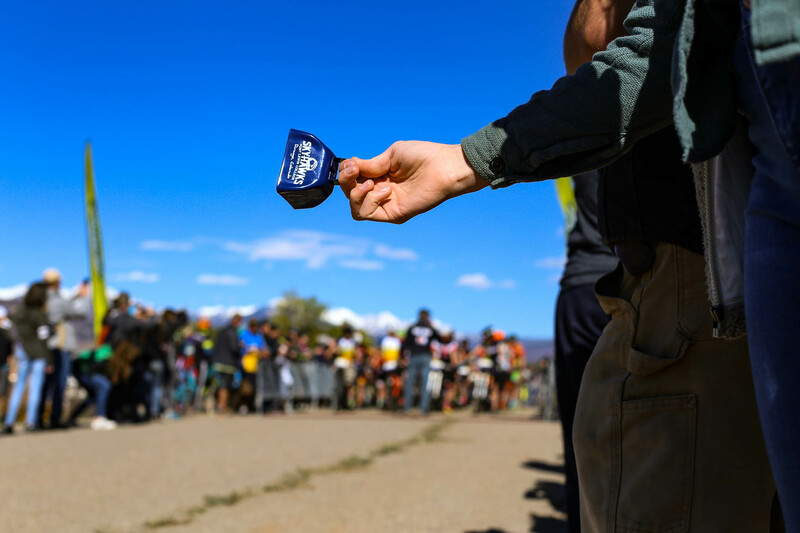 Next year will be the 10th year for the championship, and Sippy said there is hope to keep the race in Durango for not only 2019, but the following years to come. In recent years the number of riders has grown from around 350 to now somewhere around 1,300 riders who compete annually. This massive spike requires extra resources from a venue. Ada Urist (front) of Fairview pushes to maintain her place against Madigan Munro (behind) of Boulder several hundred feet before the finish. Urist beat Munro by a mere .16 milliseconds in the varsity girls race. The state championship had been hosted in Eagle, CO for the past five years. Kate Rau, the executive director for CHSCL, had been looking for a new venue since 2012 but began to put things into motion when Sippy continuously pushed for Durango to be a venue in 2015. In 2016, a request for proposal was sent and the bid was secured - Durango would host the 2018 State Championship. The process of bringing the race here to Durango was lengthy and required community-wide help. Of these key supporters were people like Mary Monroe Brown, the executive director of Trails 2000. This organization started and finished the 7.1 mile track to its completion. Gaige Sippy along with Daniel Jaber built the unique flyover that crosses over the figure eight. Marc Katz, who owns the Durango Mesa Park property where the race was held, happily supplied the venue for the race. Dave Hagen of Fort Lewis College Cycling helped coordinate the event. Tim Walsworth, the executive director of the Durango Business Improvement District, was also a key supporter in bringing the race to Durango, as well as working to keep the race coming back during our tourism shoulder season. According to Walsworth, the Central Business District was down 3% in revenue in June, July, and August of the 2018 summer. This was one of the focuses for bringing the race to Durango; to drive travelers to our beloved town and help pull it out of the ongoing 416 fire rut. Walsworth said the BID was prepared to fully sponsor the event in order to let the CHSCL know that Durango meant business and not only wanted to, but was fully committed to hosting the race. The BID put forth the initial cash sponsorship which was backed by other organizations and volunteers throughout the community that eventually led to Rau finalizing Durango as the venue for the 2018 State Championship. Rau said that 94% of the riders who qualified to compete at the State Championship registered to ride. 822 riders came with their families this past weekend, selling out hotels and enjoying the ambiance that is unique to our lovely downtown stores and restaurants lining Main Avenue. Riders and their families traveled from distances as far away as Casper, WY to race the trail and enjoy Durango’s distinct terrain. 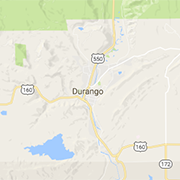 Colorado residents who have lived in the state since 1992 were able to step foot in Durango for the first time, Rau said. Needless to say, she could feel the excitement from the riders. 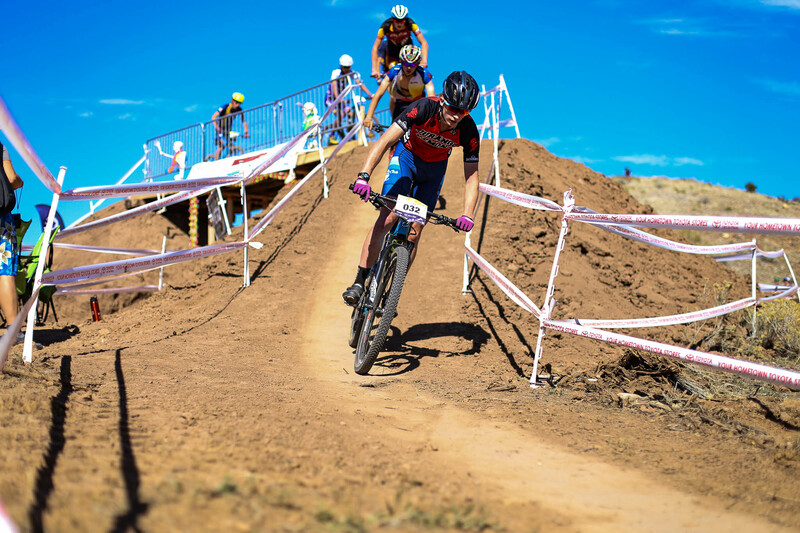 Not only did Durango get to show off its terrain, town, and community-driven people, but it got to show off its dedication to the sport of cycling. In one aspect, organizations such as Trails 2000 and the BID offered immense support to the CHSCL. An event this size requires donations, sponsorships, and a multitude of volunteers that were more than covered by the organizations in Durango. In another aspect, Durango riders showed up on the trail. Cole Freeburn of Durango comes down the flyover on the third lap in first place with a tight trail of riders behind him. Durango High School placed first in Division 2 with 4,846 points. Right below them was Animas High School with 4,233 points. Riders throughout Durango made it clear that they were ready for a state title, and they got it - both 1st and 2nd place. Varsity boys took 4 laps around the track, an exhausting 28.4 miles. Cobe Freeburn of Durango pushed ahead in the final lap to finish in 1st with a time of 1:47:06.54. Riley Amos of Animas High School placed 4th in the varsity boys with a time of 1:48:16.36, which makes two Durango boys in the top five placements for varsity. Varsity girls raced through 3 laps, and Ruth Holcomb of Durango finished in 4th with a time of 1:34:00.72. Aleah Austin of Durango, who competed in the sophomore girls category with 2 laps, finished in 1st place with a time of 1:07:34.47. In freshman girls, Lauren Aggeler of Durango finished in 5th after two laps and a time of 1:08:13.94. Freshman boys had a Durangoan finish in first; Colby Simmons with two laps coming in at 55:58.22. A bystander rings the classic cowbell in support of the Junior Varsity boys starting their three-lap race.